EnglishWorks provides an opportunity for young Brazilian adults and adults living in low income communities to learn English in a new way, using technology and connecting students with native English speakers. This promotes learning and cultural exchange. Classes take place at Naves and Praças do Conhecimento in Rio de Janeiro. EnglishWorks is the result of a partnership between the Sequoia Foundation and The Secretary of Science and Technology of Rio de Janeiro. 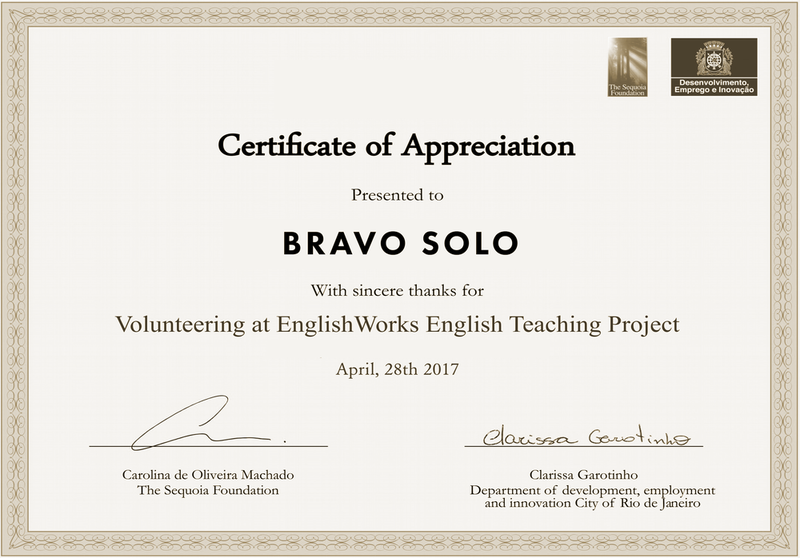 BravoSolo contributes time and resources in the form of volunteer conversation sessions with EnglishWorks students mimicking real-world workplace scenarios which help students secure employment in English dependent positions. BravoSolo also makes a quarterly contribution of profits which reinforces our commitment to passing on a portion of the prosperity and opportunity which our clients have so generously shared with us by entrusting BravoSolo as their digital agency.